Science fiction is a genre of limitless possibilities, but that doesn't mean there aren't a few ideas writers keep coming back to as trusty old standbys. 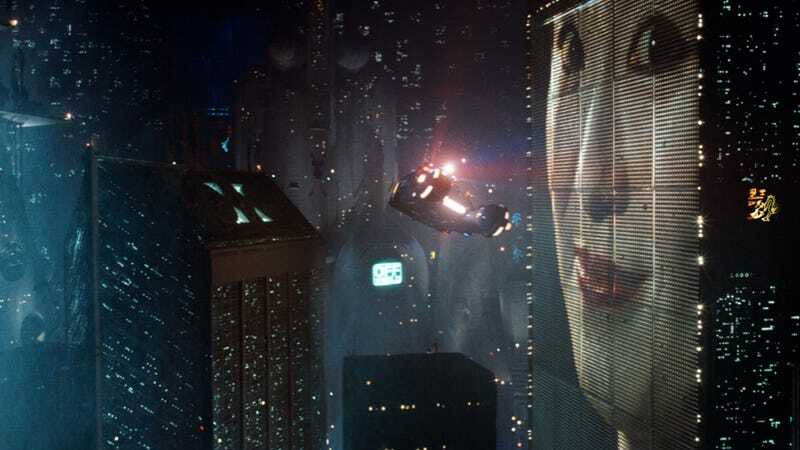 Here are ten of science fiction's most common tropes...and how they've evolved. The Forerunner: Fritz Lang's Metropolis. Although Czech playwright Karel Čapek gave us the word robots with his 1921 play R.U.R., it was the German auteur's 1927 epic that introduced the world at large to the idea of mechanical men and women who could look just like people, yet have none of their essential humanity. The look of the mad inventor Rotwang's "Machine-Man" has been a basic template for the design of robots ever since. The Iconic: Isaac Asimov's Robot stories. Asimov always said his stories about robots and the three laws that governed them were his effort to combat what he called the "Frankenstein complex", the irrational fear of what were ultimately supposed to just be helpful machines. As such, he developed three basic safeguards that governed all robot behavior, then spent fifty years trying to knock them down. The fact that he never really succeeded - and the fact that a lot of writers have since "borrowed" his laws for their own robots - tells you all you need to know about the success of his laws. The Modern Twist(s): Transformers and Blade Runner. I doubt these two beloved works of eighties science fiction get compared all that much, but they present the two extremes of where robot fiction could progress. On the one hand, Transformers has robots with no obvious biological creators that can exist independent of humans without any particular trouble. In this case, robots aren't used to comment on humans - they're just robots because robots are awesome. On the other hand, Blade Runner presents replicants that are practically indistinguishable from humans, throwing into even sharper relief the thorny moral question of humanity creating an intelligence in its own image - a point that Battlestar Galactica later stretched to even more ridiculous extremes. The Forerunner: Lensman by E.E. "Doc" Smith. Often called the first space opera, Smith's universe concerned the Galactic Patrol, galaxy-spanning breeding programs, and the unfathomably ancient races of the Arisians and Eddorians...and a whole lot more than that. But crucial to the vast scale of Smith's storytelling was accepting the idea that one could travel vast interstellar distances without any trouble whatsoever. He probably didn't invent the idea- it's now such a fundamental part of the science fiction fabric that it's difficult to track down its origins - but his stories popularized the notion, expanding the scale of science fiction from cannon rides to the Moon to the entire universe. The Iconic: George Lucas's Star Wars. There are definitely more literary options - Frank Herbert's Dune and Isaac Asimov's Foundation saga leap immediately to mind - but the Star Wars universe has arguably the most crazily diverse range of lifeforms and maybe the most casual interstellar travel ever seen. In books like Foundation or TV shows like Star Trek, there's at least some indication that traveling all the way across the galaxy is a long and arduous journey. In Star Wars, characters travel from the outer rim to the center of the galaxy and back in what appears to be a matter of hours, days at most. The Modern Twist: The Stargate franchise. At least Star Wars contained itself to its one galaxy far, far away. The Stargate TV shows took the original movie's basic idea of instantaneous travel over interstellar distances and just kept expanding the scope of it. Depending on which gate technology you're using, it's possible to travel between distant galaxies in a matter of minutes, and the fact that this is being done by members of today's US Air Force just makes it cooler. Even the one solid rule of interstellar travel - you had to use a Stargate to do it easily - eventually gave way, with aliens creating powerful interstellar warships in the shows' later seasons. The Forerunner: The Time Machine by H.G. Wells. Well, obviously, right? Its title is still the preferred term for a vehicle that can travel through time, and the unnamed narrator's trip to the year 802,701 AD continues to inform time travel stories up to the present day, with the most recent references in Futurama's "The Late Philip J. Fry." At times in his literary career, Wells could barely pick up a pen without inventing a new science fiction sub-genre. The Iconic: "By His Bootstraps" and "—All You Zombies—" by Robert Heinlein. While Wells was content to explore time's eternal vastness, Heinlein dived right into the question of what would happen if you traveled to the one time you never, ever should: your own past. His 1941 story "By His Bootstraps" is all about how doctoral student Bob Wilson becomes the king of the world 30,000 years in the future, thanks to the time traveling assistance of Joe, another man, and Diktor, all of whom are just future versions of Bob. 1959's "—All You Zombies—" ups the ante by revealing the protagonist is his own mother and father, not to mention every other character we meet in the story. The Modern Twist: Robert Zemeckis's Back to the Future. Sure, it's now 25 years old and verging into iconic territory itself, but it's probably the most famous time travel story ever, and definitely the most fun. (It's also become a fascinating repository of dated 80s slang and mid-period Huey Lewis.) What's the big twist, you ask? Well, it took the boring old time machine concept and put it inside a Delorean. As Doc Brown observes, "if you're gonna build a time machine into a car, why not do it with some style?" The Forerunner: Superman by Joel Siegel and Joe Schuster. Yeah, you could make arguments for pulp heroes like The Shadow, The Phantom, and Doc Savage, not to mention H.G. Wells's invisible man and the mythological Hercules, but even the might son of Zeus is just a minor literary footnote compared to the Man of Steel. It's a tribute to the fact that Siegel and Schuster so perfectly nailed the superhero formula (and Superman had the best lawyers - just ask Captain Marvel) that the Last Son of Krypton is still going strong 72 years after Action Comics #1 was first published. The Iconic: Spider-Man by Stan Lee and Steve Ditko. You could of course make a very strong argument that Superman deserves to be both the forerunner and the iconic superpowered character, but let's give Spidey his due. As Stan Lee often (and rightly) points out, Spider-Man was pretty much the first superhero to live in a real city, to have realistic problems like paying the rent and making it to class on time. And at a time where DC heroes like Superman and Batman were headed in some very weird directions, Spidey provided a much-needed jolt of realism. It might not be an accident that Warner Bros. is still struggling to properly bring Superman's story back to the masses, while the Spider-Man movies have made a combined 2.5 billion dollars, with a reboot on the way. The Modern Twist: Watchmen by Alan Moore and Dave Gibbons. Oh, television has come so close to redefining the superhero genre, only to fall far short. Smallville is finishing up what might really be a ten-year origin story, and Heroes looked, for a brief wonderful moment in 2006, like it was going to completely redefine how the public saw superheroes. But both shows - Heroes in particular - faltered so badly that they never quite pulled off their promised update of superhero mythology. So I'll just stick with comics and go with what's still, 26 years later, the definitive deconstruction of the superhero genre. The Forerunner: Strange Case of Dr. Jekyll and Mr. Hyde by Robert Louis Stevenson. The original novel has suffered the same fate as Alfred Hitchcock's Psycho, in that nobody now remembers that the fact that Dr. Jekyll and Mr. Hyde are the same person is actually the shocking twist, not the basic premise. As such, those going back to the original novel might be surprised to discover that it's mostly about young lawyer Gabriel John Utterson trying to work out what's the matter with his acquaintance Henry Jekyll. Stevenson's groundbreaking idea of literally releasing the monster inside you has since spawned countless adaptations and launched an entire science fiction sub-genre. The Iconic: The Fantastic Four by Stan Lee and Jack Kirby. The X-Men would explore bodily mutation as a fact of existence just a couple years later, and the Incredible Hulk turned the Jeckyll and Hyde concept into the stuff of superheroics, but the Fantastic Four was probably the first story that showed life goes on, even if you've suddenly been transformed into a hideous freak. (Of course, the levels of hideousness varied from character to character.) Above all, Fantastic Four was about the strength of the family unit, and how crucial these close bonds are to holding onto your humanity in the wake of unimaginable transformation. The Modern Twist: David Cronenberg's The Fly. Look, I realize we're all jaded, what with living in a post Human Centipede: First Sequence world and all. (At least we're still living in a pre Human Centipede: Full Sequence world.) But back when Tom Six was just sewing his stuffed animals into a fluffy little centipede, David Cronenberg and Jeff Goldblum unleashed the body transformation epic The Fly, which ramped the body horror up to almost unbearable levels while still intelligently exploring what it is that makes us human. I am Brundlefly, indeed. The Forerunner: Flatland by Edwin Abbott Abbott. (Yes, that really was his name.) This 1886 satirical investigation of how a square in the two-dimensional Flatland came to perceive other universes with different numbers of dimensions (including the 3D Spaceland, the 1D Lineland, and even the 0D Pointland) is the most straightforward early example of parallel universes. It places wholly separate universes on a more or less equal footing, except for the number of dimensions each has, and then lets characters travel between them. The Iconic: "Mirror, Mirror", Star Trek. In the classic 1967 episode, we were introduced to the mirror universe, a ruthless, totalitarian cosmos where the entire crew of the Enterprise was, well, evil. Although Flatland and various fantasy novels lay the groundwork for parallel universes, it was Star Trek that really placed the notion into the popular consciousness, inspiring countless imitators and parodies. More importantly, it introduced the best shorthand ever for evil parallel universe duplicates: a goatee! The Modern Twist: Fringe. The show is still slowly unveiling the mysteries of the alternate universe, a world where, among other things, the World Trade Center wasn't destroyed on September 11...but the White House was. The upcoming season is delving even deeper into the concept of parallel universes, with each episode alternating between the two worlds and the promise that we'll come to sympathize with both universes' versions of the characters. The Forerunner: The War of the Worlds by H.G. Wells. Wells's 1898 story of invaders from Mars took the then popular British sub-genre of invasion literature and simply substituted the French and Germans with Martians. While invasion literature died out (perhaps because a bunch of Frenchmen in hot air balloons isn't really a serious enough threat to sustain an entire genre), Wells's book awoke readers to a sobering realization: if there are aliens advanced enough to visit us, they're also advanced enough to wipe us off the face of the Earth. Thankfully, the aliens are defeated by common Earth bacteria, setting up a vibrant tradition of super-intelligent aliens being defeated by really obvious things, such as the common cold and water. The Iconic: Every Doctor Who episode, 1970-1974. During the budget-slashed, Earth-exiled Jon Pertwee era, the Third Doctor and UNIT faced invasions by (deep breath) the Nestene Consciousness and the Autons, the Silurians the Mind Parasite, the Axons, the Daemons, the Daleks, the Sea Devils, antimatter creatures, a Sontaran, and, just for the hell of it, super-intelligent spiders. And that's not even counting the Doctor's own best enemy, the Master. Why the sudden spike in alien invasions? Something to do with radio signals, apparently. The Modern Twist: Neill Blomkamp's District 9. Blomkamp's movie is maybe the clearest crystallization yet of the idea that even if aliens are unpleasant, humans can still be the real monsters. (It's also an Apartheid allegory, but for the sake of simplicity let's just stick with the purely science fiction elements.) Indeed, you could definitely argue the "invasion" isn't anything of the sort, considering none (or almost none) of the aliens were actually able to fly their ships and ended up hovering above Johannesburg purely by accident. Blomkamp's proposed sequel, District 10, might well involve a more traditional, vengeance-driven alien invasion. The Forerunner: The Picture of Dorian Gray by Oscar Wilde. In Wilde's only novel, a vain, debauched fop named Dorian Gray sells his soul so that a portrait of him will age in his stead. Although immortality and eternal youth obviously go all the way back to the gods of old mythology, Dorian Gray is one of the first modern explorations of how a mortal might deal with the gift - or curse - of never growing old. Dorian Gray himself has gone on to appear in some more explicitly science fictional works, including Alan Moore's League of Extraordinary Gentlemen and James Robinson's run on Starman. The Iconic: "Long Live Walter Jameson", The Twilight Zone. Rod Serling's legendary anthology series tackled immortality a few times, and the show always came to pretty much the same conclusion: people need death just as much as they need life. Maybe the show's purest exploration of this idea is the episode "Long Live Walter Jameson", in which an elderly man in the 1960s discovers his daughter's future husband somehow fought in the Civil War...and, as it turns out, that barely even begins to describe how old he really is. The episode ends with the 2,000 year old Jameson's death, as he's finally confronted with the sins of his eternal past. The Modern Twist: The Highlander franchise. The original 1986 film took the tired old concept of eternal life and added some much needed pizazz, including sword fights, lots of beheadings, immortals killing other immortals for their life energy, and Sean Connery playing an Egyptian pretending to be a Spaniard. If nothing else, the movie gave us at least three or four classic Queen songs, including the all-important question, "Who wants to live forever?" As it turns out, the Highlander franchise did, quietly undoing the first movie's fairly definitive ending to open up the possibility of increasingly insane sequels and TV shows. The Forerunner: Last and First Men by Olaf Stapledon. This 1930 book is one of the most ambitious future histories ever devised, spanning billions of years of human history. (His 1937 follow-up, The Star Maker somehow manages to be even more crazily ambitious.) Obviously, with so much history, there's a ton of ground to cover, but the first (of eighteen!) ages of humanity ends with a nuclear holocaust that kills all but 35 people. Of course, considering there are still seventeen more ages to go, humanity does get better, but that has to be considered a low point. The Iconic: George Miller's The Road Warrior. Look, there are a lot of great post-apocalyptic movies out there. But only one of them turned the Australian Outback into a giant leather bar and turned survival itself into one long car chase, and that's The Road Warrior. (Well, there were two other Mad Max movies, but this was the best of the bunch.) Set in a vaguely described post-apocalyptic world that's reeling from nuclear war, peak oil, and the collapse of civilization, The Road Warrior stars an Australian-accented Mel Gibson before he became utterly reprehensible. And, again, those car chases. The Modern Twist: The Road by Cormac McCarthy. This Pulitzer Prize winning 2006 novel is about as bleak as bleak gets, as an unnamed father and son trudge down a decaying highway on a dead Earth. For much of the book, it seems as though everything is utterly hopeless, as the last dregs of humanity wile away their days on a burnt-out cinder that used to be their planet. (For some reason, the mostly faithful movie adaption didn't pick up much of an audience.) Ultimately, the book ends on a note of minor optimism, but this book comes closer than almost any other in showing us The End - not just a great disaster or setback for humanity, but the real and actual end of the line. The Forerunner: H.P. Lovecraft's Cthulhu Mythos. Are Lovecraft's beings aliens? Interdimensional monsters? Gods? Does it matter? Whatever Lovecraft's cosmic entities were, they're awe-inspiring beings of immense power. Cthulhu, for his part, was perhaps born on the planet Vhoorl at a time of immense supernova activity. He since molded the dreams of the first humans to guide their development and ensure the establishment of a doomsday cult devoted to him. And he might not even be the worst of the Great Old Ones. The Iconic: 2001: A Space Odyssey, Rendezvous with Rama, and Childhood's End by Arthur C. Clarke. When Clarke introduced aliens into his story, he generally made them impossibly advanced beings, with vast, cosmos-spanning designs that were mostly beyond the limits of human comprehension. Mostly, aliens were around to help humans ascend to the next phase of their evolution, whether we wanted to or not. To cite a corollary of Clarke's famous law, "Any sufficiently advanced alien is indistinguishable from a god." The Modern Twist: Doctor Who 2005-2010. The Doctor has always been amazingly powerful, what with the TARDIS and the regenerating and whatnot, but it's the revived series that's really suggested he's on his way to godhood. His fellow Time Lords are locked away forever in the Time War, which is also supposed to have wiped out most of the cosmos's higher intelligences. He's been taking faltering steps toward omnipotence ever since, seriously considering the offer of godhood in 2006's "School Reunion" and temporarily naming himself the all-powerful Time Lord Victorious in last year's "The Waters of Mars." And the rest of the universe seems to agree - to capture him at the end of the last series, an alien alliance had to build the Pandorica, a supposedly mythical prison meant to hold a trickster god. Which as it turns out, is pretty much what the Doctor is at this point, at least to his enemies.